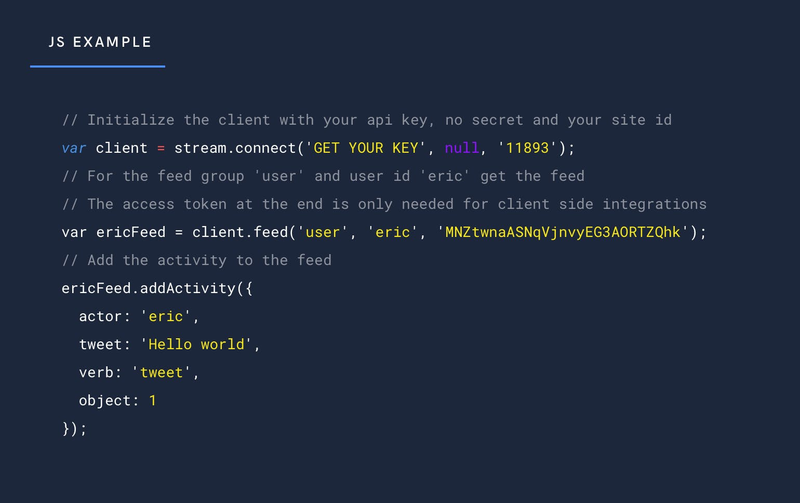 Power the backbone of your Node JS Social Network with the Stream API. Stream for Node client on Github. Speed up your development. Node Aggregated Feeds, Ranked Feeds, feed specific analytics and personalization all help you improve your app's engagement, retention and conversion. With years of building and maintaining large scale feeds; we’ve solved some of the hardest problems when it comes to speed and reliability (especially for node.js). We’ve consistently matched (or beat) benchmarks for updates against the leading Node social networks online. Your data is backed up in multiple locations around the world, protecting your users and your business. Node. is built on the same V8 engine that’s included in Google’s Chrome browser. It is architected around an event loop and emphasises asynchronous, non-blocking I/O. Most importantly, it is well suited to building scalable applications such as social networks and dynamic applications with rich social features. To accelerate development on the node.js runtime, several popular web frameworks and libraries have emerged. With a strong package manager, npm, in place early on in the life of Node, the developer community has tended toward smaller, focussed libraries rather than all-in-one frameworks. As a result it’s far more common to integrate multiple single-purpose libraries when building with Node. That said there are also popular frameworks like Express.js, Hapi, Koa and Sails.js. Restify.JS is also a popular choice for Web APIs and web applications that make use of a decoupled SPA frontend such as Angular.JS or React.JS. Our Client API for Node is stream-js. Continuous integration is via Travis and we publish to the Node Package Manager. Contributions in the form of issues, feature suggestions and pull requests are most welcome. See also our Stream Node ORM package. mail_outlineContact us if you're using Node.js and want to be featured.